U.S. President Donald Trump and NATO Secretary General Jens Stoltenberg during their bilateral breakfast ahead of the NATO summit, Brussels, July 11, 2018 (AP photo by Pablo Martinez Monsivais). As Hastings Ismay, NATO’s first secretary-general, famously put it, the alliance’s purpose in Europe was to keep the Russians out, the Americans in and the Germans down. 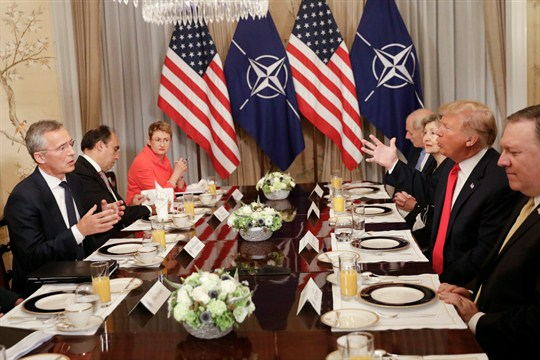 By all indications, U.S. President Donald Trump, who arrived in Brussels yesterday for his second NATO summit, is dead set on reversing all three elements of Ismay’s formula.